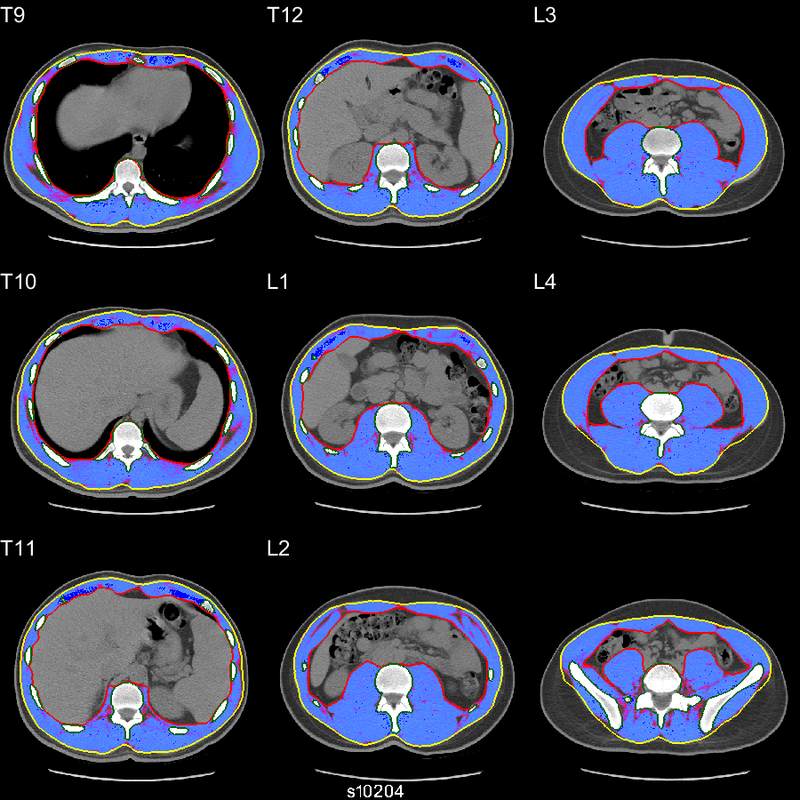 This page describes morphomics measures available for every chest/abdomen/pelvis scan in our CT database. 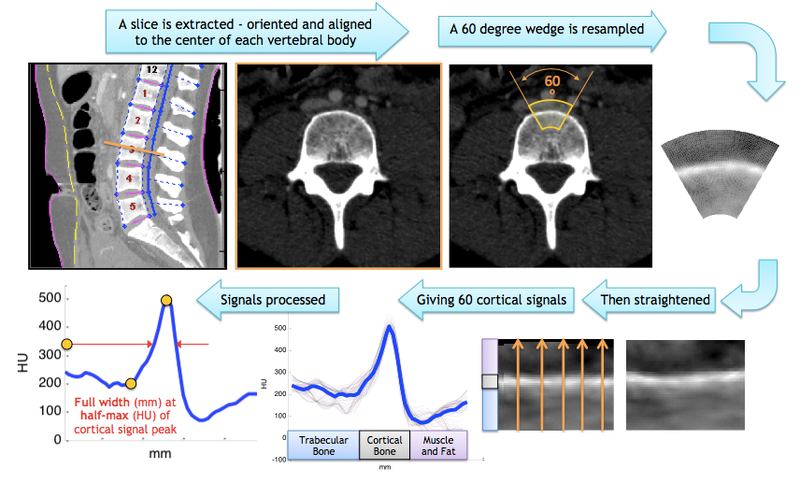 Most measures are taken "per vertebra" at each vertebral level visible in the CT scan, allowing morphomics to be reported as a function of body region. A number of measures of muscle density are reported in Hounsfield Units (HU), and often separated into Normal Density Muscle (NDM) and Low Density Muscle (LDM). The thresholds for these come from the paper: Goodpaster BH, Kelley DE, Wing RR, Meier A, Thaete FL. Effects of weight loss on regional fat distribution and insulin sensitivity in obesity. Diabetes. 1999;48(4):839-47. This can be thought of as "normalizing a muscle's density between -85 HU (very fatty and low density) and +85 HU (very dense)". The values of ±85 were chosen by inspection of some of our sickest and healthiest individuals' data points. FASCIAECCENTRICITY ratio Eccentricity of an ellipse having the same second-moments of the fascia region. (Ratio of major-axis length to the distance between ellipse foci). A circle has eccentricity of 0, while a line has eccentricity of 1. 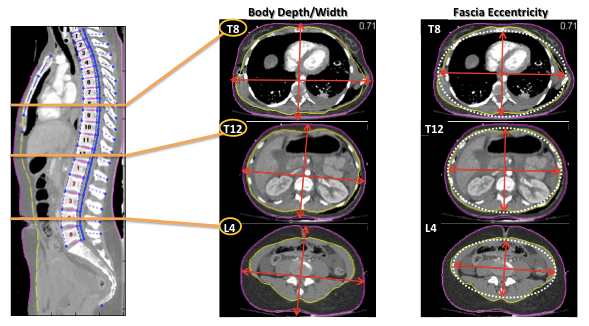 SUBCUTFATHU HU Median pixel intensity of fat-intensity pixels (-205 to -51 HU) in the subcutaneous region. Not computed when fewer than 200 pixels of fat exist. 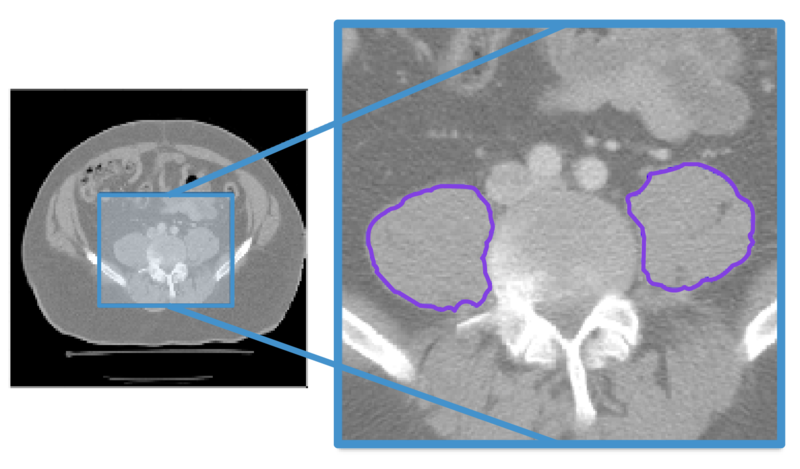 VISCERALFATHU HU Median pixel intensity of fat-intensity pixels (-205 to -51HU) inside the visceral cavity. Not computed when fewer than 200 pixels of fat exist. expmuscarea mm² Cross sectional area of the muscle pixels (-29 to 150 HU, expanded range) between the muscle wall and fascia boundaries (excluding filled bone, spinal canal and disk). vldmarea mm² Cross sectional area of the skeletal muscle falling in a very low density muscle HU range (-29 to -1). ldmarea mm² Cross sectional area of the skeletal muscle falling in a low density muscle HU range (0 to 30). ndmarea mm² Cross sectional area of the skeletal muscle falling in a normal density muscle HU range (30 to 100). hdmarea mm² Cross sectional area of the skeletal muscle falling in a high density muscle HU range (100 to 150). The psoas muscles are core muscles running alongside the lumbar spine. 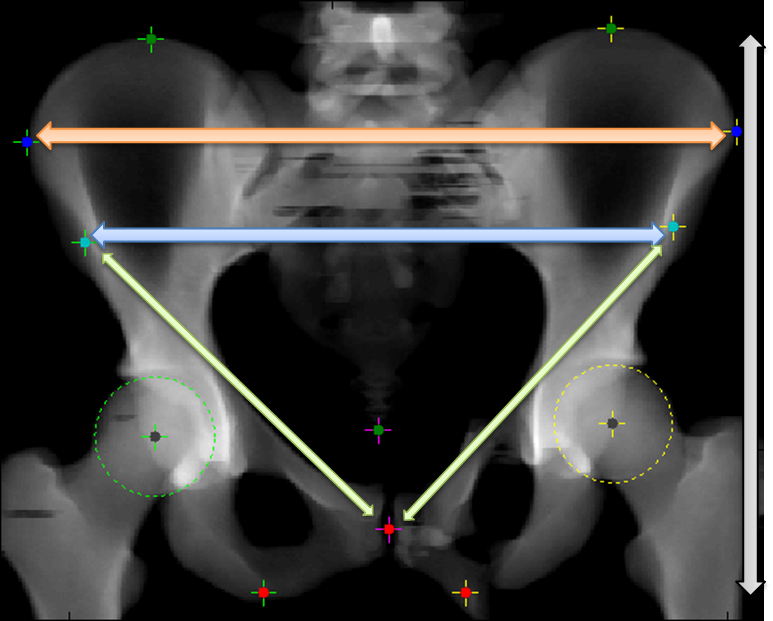 TOTAL_PSOAS_EXPMAREA mm² (PMA) Cross sectional area of the muscle pixels (-29 to 150 HU, expanded range) within the perimeter of the left and right psoas. DMG Boundary Area mm² Cross sectional area of the DMG perimeter boundary IRRESPECTIVE OF bone/muscle/air contents. 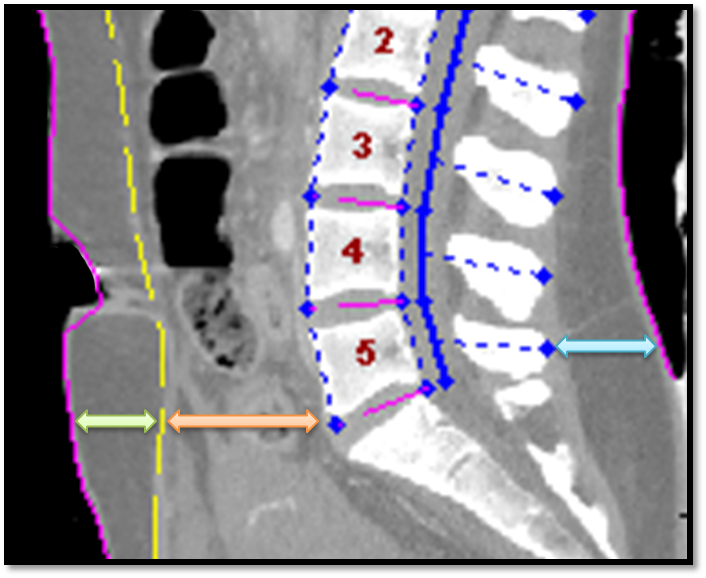 Boundary is built from triangle between spinal canal and left/right lateral seams, connected by nearest location to the posterior fascial envelope. DMG Muscle Area mm² Cross sectional area of the muscle pixels (-29 to 150 HU, expanded range) within the DMG perimeter. DMG Mean HU HU Mean pixel intensity of muscle pixels (-29 to 150 HU) within the DMG boundary. DMG Median HU HU Median pixel intensity of muscle pixels (-29 to 150 HU) within the DMG boundary. DMG Low Dens. Mean HU HU Mean pixel intensity within Low Density Muscle (0 to 30) pixels inside the DMG boundary. DMG Low Dens. Median HU HU Median pixel intensity within Low Density Muscle (0 to 30) pixels inside the DMG boundary. DMG Normal Dens. Mean HU HU Mean pixel intensity within Normal Density Muscle (31 to 100) pixels inside the DMG boundary. DMG Normal Dens. Med HU HU Median pixel intensity within Normal Density Muscle (31 to 100) pixels inside the DMG boundary. Morphomics is incredibly collaborative in nature, and its true power comes from bringing together experts and data from many fields to tackle important questions about human health and well-being.